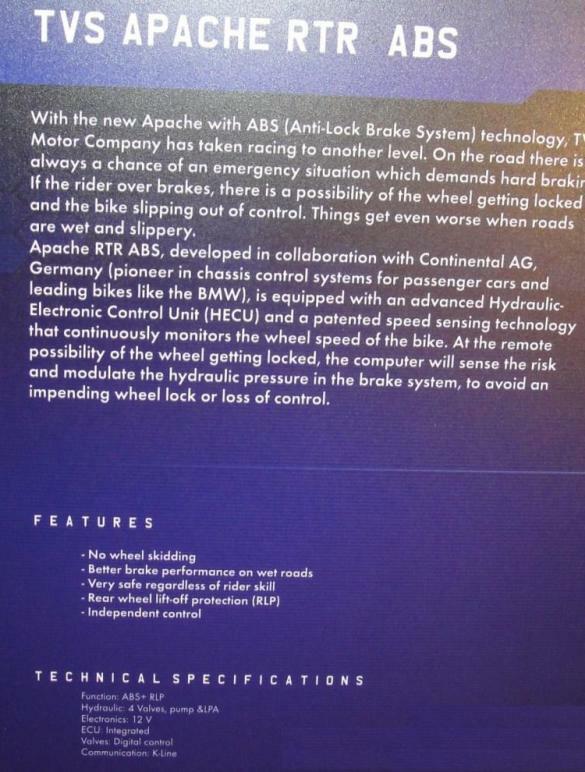 The TVS Apache RTR 180 would get ABS (Anti Lock Braking System) soon.. If the ABS unit works perfectly, then believe me it is worth every paise.. The race to be the first Indian manufacturer to feature ABS (Anti Lock Braking System) on a Made in India motorcycle seems to be on between Honda and TVS. While Honda has started taking bookings for its CBR250R (one of the variant would feature ABS) the deliveries of which are slated to start from April 2011, TVS have started to make some PR buzz to announce to the world that it is ready to plonk in the ABS unit on its bikes. 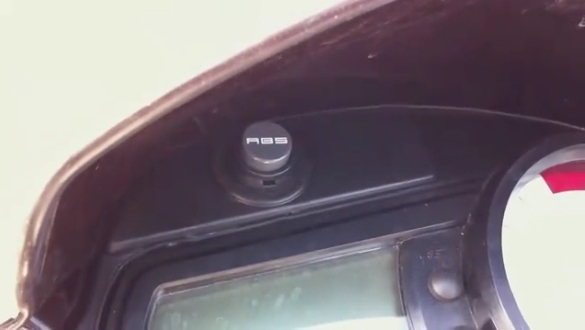 Auto magazine Overdrive has posted a video of TVS demonstrating the ABS on an Apache RTR 180. 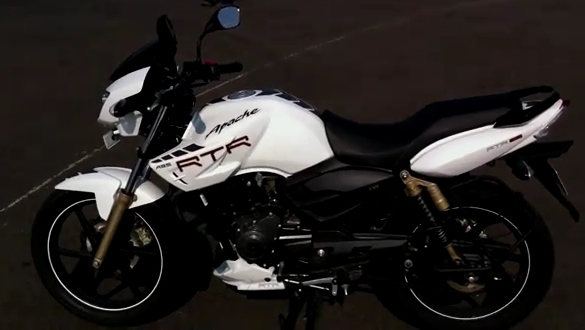 The new Apache RTR 180 does not appear to be different in terms of looks. 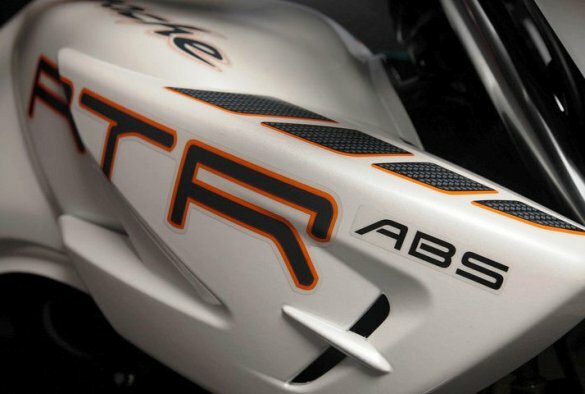 The letters "ABS" have been put on the tank scoops to differentiate the ABS from the Non ABS Apache RTR 180. Also according to Overdrive the new Apache RTR 180 would feature DC lighting (Headlamp connected directly to the battery to provide flicker free light) at last. The ABS unit which has been developed by TVS in collaboration with Continental AG of Germany has the option of switching off. 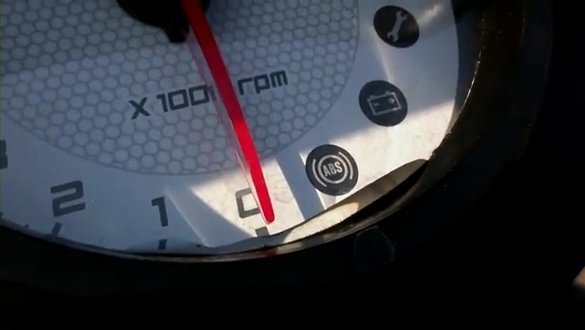 The toggle switch can be found on top of the Speedometer console. A visual indication for the ABS unit is provided on the console as well. The official word for the final pricing is yet to be announced, but according to whatever little news that I have, it probably would be priced at Rs. 8,000-10,000 more than the regular Apache RTR 180. Is Rs. 8,000-10,000 extra for a safer braking system worth..?? I can tell two instances in my life where I have fell down from motorcyles because of a front wheel lock over sandly/gravel surfaces, and believe me both time I wasn't riding any faster than 30 Kmph..!! If the ABS unit works perfectly as it is supposed to be, then believe me it is worth every paise. There is no price greater than one's life. But then in a country like ours where most people still do not bother to put on a Rs. 500 helmet while riding, can we really expect them to go gaga over costly tech like ABS..?? When I think about it, I guess its really good to know that when manufacturers improve their products, they think of their customers/buyers safety first and not their sales. I mean that should be their first priority. No customer would want to buy a motorcycle that will put them in danger. And I agree with you a hundred percent that there is no price greater than one's life. +10000 for the last few lines. Here in my city, a few month back, it was clearly advised by our uncles (not relatives) to wear helmets only if one is going through Army Area. Whats the problem is with lid ?? Whether their hair get white, blue or something? Whether their precious, hero type face get blurred or what ? Whether they are not able to spit around ? Whether helmet wants more maintenance than cost of bike ? Whether they feel vaccuum in that or what ? Why do they take the risk? For me, helmets are more a defination for a biker. And for Apache ABS, NOW i build some more good trust for Indian Companies in account of safety. It is a great step and i wish to go ahead and move. is there anyway to fit the system to rtr 160 hyperedge? Can we expect tvs to launch it in form of kits?